Countries seek FDI to help them grow and develop. Their national policies are key to attracting FDI and increasing its benefits. Countries conclude international investment agreements (IIAs) – at the bilateral, regional and multilateral levels – for various reasons. For most host countries, it is mainly to help attract FDI. For most home countries, it is mainly to make the regulatory framework for FDI in host countries more transparent, stable, predictable and secure – and to reduce obstacles to future FDI flows. In either case, the regulatory framework for FDI, at whatever level, is at best enabling. Whether FDI flows actually take place depends in the main on economic determinants. The number of IIAs, especially at the bilateral and regional levels, has greatly increased in the past decade, reflecting the importance of FDI in the world economy (see Part One of this WIR). At the bilateral level, the most important instruments are bilateral investment treaties (BITs) and double taxation treaties (DTTs), with 2,181 BITs and 2,256 DTTs signed by the end of 2002. BITs are primarily instruments to protect investors, although recent agreements by a few countries also have more of a liberalizing effect. (They are not concluded between developed countries.) They cover an estimated 7% of the stock of world FDI and 22% of the FDI stock in developing and CEE countries. DTTs are primarily instruments to address the allocation of taxable income, including to reduce the incidence of double taxation. They cover some 87% of world FDI and some 57% of FDI in developing and CEE countries. Although a few regional agreements deal exclusively with investment issues, the trend so far has been to address such issues in trade agreements. (The same applies to bilateral trade agreements.) 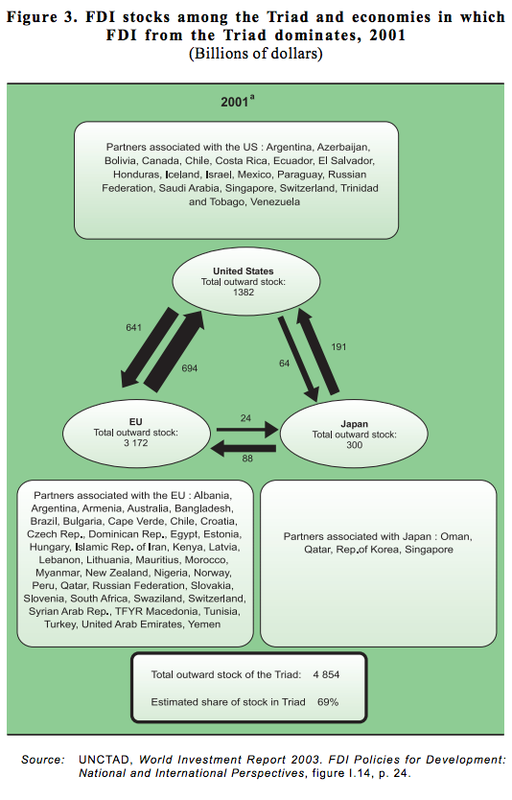 In effect, free trade agreements today are often also free investment agreements. At the multilateral level the few agreements that exist deal with specific investment-related issues (such as trade-related investment measures, insurance, dispute settlement, social policy matters) or they are sectoral (such as the General Agreement on Trade in Services (GATS)). There is no comprehensive multilateral agreement for investment, although issues pertaining to such an idea are currently being discussed in the WTO. Overall, the growth in the number of IIAs and their nature reflect the fact that national policies in the past decade have become more welcoming to FDI. During 1991ñ2002, 95% of 1,641 FDI policy changes had that effect. Issues relating to IIAs are therefore coming to the fore in international economic diplomacy. This is so irrespective of what will or will not happen at the multilateral level, simply because of what is happening now at the bilateral and regional levels. But if negotiations should take place at the multilateral level, these issues will acquire even greater importance. Whether governments negotiate IIAs, at what level and for what purpose is their sovereign decision. The objective of this WIR is simply to throw light on a range of issues that needs to be considered when negotiating IIAs, seeking to clarify them from a development perspective (and regardless of the outcome of the ongoing multilateral investment discussions). Almost by definition, IIAs affect, to a greater or lesser extent, the regulatory framework for FDI, depending on their exact content. As a rule, they tend to make the regulatory framework more transparent, stable and predictable – allowing the economic determinants to assert themselves. The expectation is that, if the economic determinants are right, FDI will increase. In that respect, therefore, IIAs can influence FDI flows when they affect their determinants. … which, by their nature, entail a loss of policy space. Experience shows that the best way of attracting FDI and drawing more benefits from it is not passive liberalization alone. Liberalization can help get more FDI. But it is certainly not enough to get the most from it. Attracting types of FDI with greater potential for benefiting host countries (such as FDI in technologically advanced or export oriented activities) is a more demanding task than just liberalizing FDI entry and operations. And, once countries succeed in attracting foreign investors, national policies are crucial to ensure that FDI brings more benefits. Policies can induce faster upgrading of technologies and skills, raise local procurement, secure more reinvestment of profits, better protect the environment and consumers and so on. They can also counter the potential dangers related to FDI. For example, they can contain anticompetitive practices and prevent foreign affiliates from crowding out viable local firms or acting in ways that upset local sensitivities. The instruments needed to put these policies in place tend to be limited – or excluded altogether – by entering into IIAs. What are the issues? For developing countries, the most important challenge in future IIAs is to strike a balance between the potential contribution of such agreements to increasing FDI flows and the preservation of the ability to pursue development-oriented FDI policies that allow them to benefit more from them – that is, the right to regulate in Overview 19 the public interest. This requires maintaining sufficient policy space to give governments the flexibility to use such policies within the framework of the obligations established by the IIAs to which they are parties. The tension this creates is obvious. Too much policy space impairs the value of international obligations. Too stringent obligations overly constrain national policy space. Finding a development-oriented balance is the challenge – for the objectives, structure, implementation and content of IIAs. Many IIAs incorporate the objective of development among their basic purposes or principles, as a part of their preambular statements or as specific declaratory clauses articulating general principles. The main advantage of such provisions is that they may assist in the interpretation of substantive obligations, permitting the most development friendly interpretation. This promotes flexibility and the right to regulate by ensuring that the objective of development is implied in all obligations and exceptions thereto – and that it informs the standard for assessing the legitimacy of governmental action under an agreement. The structure of agreements may reflect development concerns through special and differential treatment for developing country parties. This entails differences in the extent of obligations of developed and developing country parties, with the latter assuming, either temporarily or permanently, less onerous obligations that are also non-reciprocal. Particularly important is the approach to determine the scope of commitments. Under a “negative list” approach, countries agree on a series of general commitments and then list, individually, all the areas these commitments do not apply to. This approach tends to produce an inventory of non-conforming measures. It also increases predictability because it locks in the status quo. Under a (GATS-type) “positive list” approach, countries list commitments they agree to make and the conditions they attach to them. This approach has the advantage that countries can make commitments at their own pace and determine the conditions for World Investment Report 2003 20 FDI Policies for Development: National and International Perspectives doing this. For these reasons the positive list approach is generally regarded as more development friendly than the negative list approach. In theory, both approaches should arrive at the same result, if countries had the capacity to make proper judgments about individual activities – or, more broadly, about making commitments – when concluding an agreement. In practice, it is unlikely that developing countries would have all the information necessary to make the necessary judgments at the time of concluding agreements. As a result, the negative list approach might involve greater liberalization than countries may wish to commit themselves to start with. But even a positive list approach can lead to significant liberalization – because in practice, negotiations generate pressures on countries to assume higher and broader commitments. And once a commitment has been made, it is difficult to reverse it. Whether an agreement is legally binding or voluntary affects the intensity of particular obligations. Indeed, it is possible to have a mix of binding commitments and non-binding “best effort” provisions in one agreement. So, development-oriented provisions could be either legally binding or hortatory, depending on how much the parties are willing to undertake commitments. The asymmetries between developed and developing country parties to IIAs can be tackled by commitments of the developed country parties to provide assistance to the developing parties, especially LDCs. An example is the TRIPS Agreement, in which developed countries have made commitments to facilitate technology transfer to LDCs. Also relevant here is the wider issue of home country commitments to promote the flow of FDI to developing countries, perhaps complemented by provisions for technical assistance through relevant international organizations. These are important, given the complexity of the subject matter and the limited capacity of many developing countries, especially LDCs, to fund FDI-related policy analysis and development and for human and institutional development. Institutional development also involves assistance to developing countries to attract FDI and benefit more from it. The quest for a development friendly balance plays itself out most importantly in the negotiations of the content of IIAs. Central here is the resolution of issues that are particularly important for the ability of countries to pursue development-oriented national FDI policies – and that are particularly sensitive in international investment negotiations, because countries have diverging views about them. The definition of investment, because it determines the scope and reach of the substantive provisions of an agreement. The scope of national treatment (especially as it relates to the right of establishment), because it determines how much and in what ways preferences can be given to domestic enterprises. The circumstances under which government policies should be regarded as regulatory takings, because it involves testing the boundary line between the legitimate right to regulate and the rights of private property owners. The scope of dispute settlement, because this raises the question of the involvement of non-State actors and the extent to which the settlement of investment disputes is self-contained. The use of performance requirements, incentives, transfer-of technology policies and competition policy, because they can advance development objectives. Other important matters also arise in negotiations for IIAs, especially most-favoured-nation treatment, fair and equitable treatment and transparency. But these appear to be less controversial. For each of these issues, more development friendly and less development friendly solutions exist. From the perspective of many developing countries, the preferable approach is a broad GATStype positive list approach that allows each country to determine for itself for which of these issues to commit itself to in IIAs, under what conditions, and at what pace, commensurate with its individual needs and circumstances. In pursuit of an overall balance, furthermore, future IIAs need to pay more attention to commitments by home countries. All developed countries (the main home countries) already have various measures to encourage FDI flows to developing countries in place. And a number of bilateral and regional agreements contain such commitments. Developing countries would benefit from making home country measures more transparent, stable and predictable in future IIAs. TNCs, too, can contribute more to advancing the development impact of their investments in developing countries, as part of good corporate citizenship responsibilities, whether through voluntary action or more legally-based processes. Areas particularly important from a development perspective are contributing fully to public revenues of host countries, creating and upgrading linkages with local enterprises, creating employment opportunities, raising local skill levels and transferring technology. … by making development objectives an integral part of international investment agreements. These issues are all complex. Because the potential implications of some provisions in IIAs are not fully known, it is not easy for individual countries to make the right choices. The complexities and sensitivities are illustrated by the experience of NAFTA for the regional level, that of the MAI negotiations for the interregional level and that of the GATS and the TRIMs Agreement for the multilateral level. Given the evolving nature of IIAs, other complexities tend to arise in applying and interpreting agreements. Indeed, disputes may arise from these processes, and their outcome is often hard to predict. That is why governments need to ensure that such difficulties are kept to a minimum. How? By including appropriate safeguards at the outset to clarify the range of special and differential rights and qualifications of obligations that developing country parties might enjoy. Moreover, the administrative burden arising from new commitments at the international level is likely to weigh disproportionately on developing countries, especially the least developed, because they often lack the human and financial resources needed to implement agreements. This underlines the importance of capacity-building technical cooperation – to help developing countries assess better various policy options before entering new agreements and in implementing the commitments made. The overriding challenge for countries is to find a development-oriented balance when negotiating the objectives, content, structure and implementation of future IIAs at whatever level and in whatever context. In short: the development dimension has to be an integral part of international investment agreements – in support of policies to attract more FDI and to benefit more from it. To help attract FDI, countries increasingly conclude IIAs ... ... which, by their nature, entail a loss of policy space. The challenge for developing countries is to find a development-oriented balance ... ... when negotiating the objectives, structure and implementation of IIAs ... ... and especially their content ... ... by making development objectives an integral part of international investment agreements.